I have a Packasport fiberglass car top carrier with a cylinder lock (outside view above). The key has been lost. I ordered a new lock/key set from Packasport but am unable to remove the old one - the locking nut is rusted on. I've tried Linseed Oil and WD40 and still doesn't work. 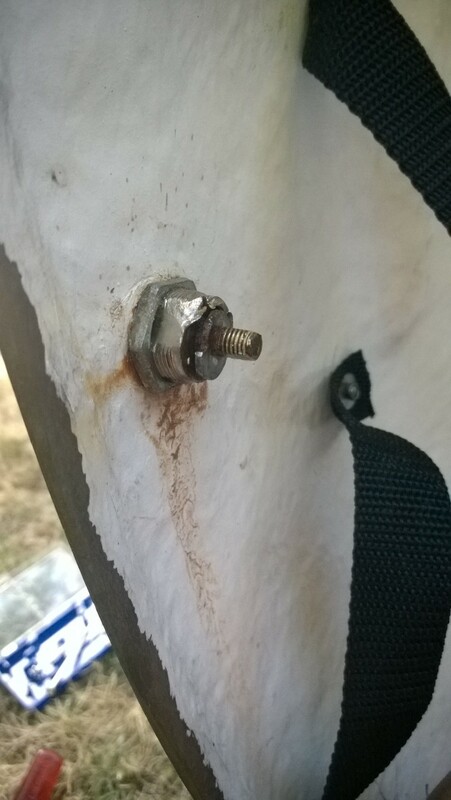 My latest idea is to drill through the locking nut that is right next to the fiberglass wall of the carrier (drilling parallel to the wall, perpendicular to the surface of the locking nut) to create a gap and then just wedge the nut off using a chisel. I don't care about damaging the existing lock but I don't want to damage the fiberglass. However, when I tried this the drill would just slip right off the (very thin) nut surface. These car top carriers are expensive (about $1000) so worse comes to worst, I'll probably just live with not being able to lock it any longer. 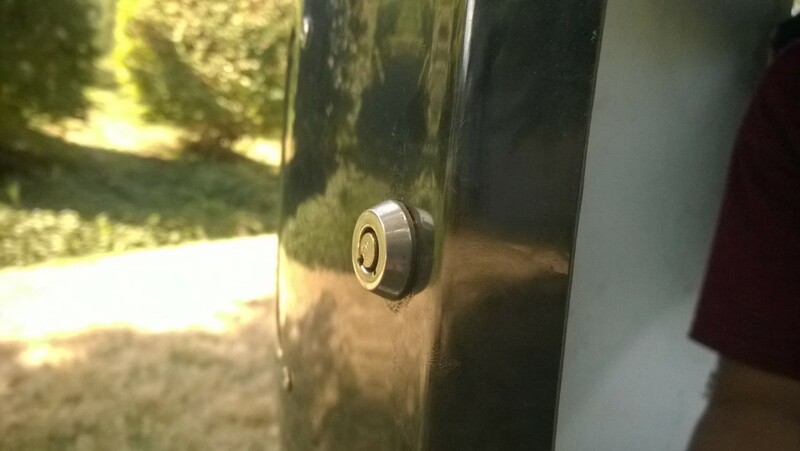 Why not leave the lock in place, drill a hole for a new lock and move the locking mechanism a few inches to the right or left? I'd use an angle grinder with a thin cutoff wheel and basically just cut either the locking nut or the whole cylinder in half. If you're reasonably careful, you should be able to do this and barely touch the fiberglass (if at all). You're much more likely to cause cracks or other damage if you are putting torque on something, and it's much easier to have fine control over an angle grinder than a reciprocating saw or a drill. If you live near or have access to a good tool supplier, Sears,Auto Zone etc. The best tool for the job in my opinion is a nut cracker. It looks similar to a pipe/tubing cutter with a chisel tip instead of a cutting wheel. Because there in no rapid motion of the tool the risk of damaging the fiberglass is reduced. they generally come in two sizes and cost under $20. Once you have one you'll find lots of use for it. My favorite tool for removing toilet hold down bolts without damage to the porcelain. Not the answer you're looking for? Browse other questions tagged lock rust-removal or ask your own question. How can I lock a sliding door that doesn't have a door lock?